Bill died on 15 July 2005 at Gloucestershire Royal Hospital of complications following the stroke, which afflicted him immediately after a society meeting on Thursday, 19 May 2005. As suggested by his faint accent, Bill was born on 4 April 1936 in Peckham, London. His father a butcher and his mother only died 2003, aged 95. He was evacuated to stay with relatives in Chard, Somerset but only remained for a short time during the “Phoney War”; the rest of the war was spent in London. After the end of the war, he passed the 11+ Scholarship examination and studied at Wilson’s Grammar School, Camberwell: apparently Michael Caine was also a pupil! Hints of his future career came with his joining the ATC. 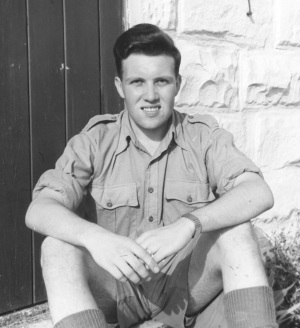 Bill left school at 16, being one of the first cohort to take ‘O’ Levels and became a laboratory technician in a paint factory until, at 18, he joined the RAF as a regular on a four-year enlistment. He served as a radar technician from 1954 until 1958; firstly, at Yatesbury in Wiltshire for basic training, Hope Cove in Devon and then Locking, near Weston super Mare. Fate took a hand here when he met June Kelland at a dancing class. He left RAF as a Cpl. and married June in 1958. Two boys followed: David (1960) who is a quantity surveyor and Chris (1963) who is a Civil Servant. His new career started as a Civil Servant near Taunton and it was not until 1971 that Bill & June moved their family to Tewkesbury where houses were available. Working now at Cheltenham, he foreshadowed his expertise with our publications as he wrote technical manuals - and dealt professionally with Dave Devereux of Fleet Graphics. When it was time to retire in 1993 he was a line manager. THS benefited from his very active retirement. He joined THS after a public meeting at the Library and when the other Bill - Rennison - toured New Zealand in 1994, he deputised as Treasurer and thus commenced the 'Two Bills' managing our bills so successfully in tandem for the past 11 years. Because of his background as a Civil Servant, he was able to understand the technicalities to liaise with printers. Without his guidance, I fear that I will never properly understand the vagaries of “pixels” and “half tones”. All I know is that the quality of our production has increased because of his relationship with the printers. He was also a natural diplomat with a wry sense of humour who could bring the best out of talented people when others of us would fail. He was as much at home dealing with the artistic temperament as he was with demanding historians. He seemed to possess infinite patience and his reward was working with Derek Round to produce the article ‘91 Church Street and J.M.W. Turner’, which was a worthy winner of the Woodard Award in 2000. Bill exemplifies how enriched the Society has become with the participation of those who love History, but who come from other walks of life and who possess skills which enhance so significantly those of the Historian. However, other organisations benefited from his time and enthusiasm. At the Abbey, he was a sides-man and tower guide. In addition, he volunteered for St. John’s Guild for the blind. Always a committed family man, he has also constructed a working model of the Waverley Paddle Steamer for his two grandchildren, Ben and Jennifer. 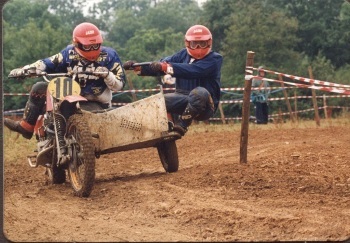 Perhaps his most amazing pursuit - worryingly no doubt for June - was his enjoyment of Motor-Cross in tandem with son Chris. Bill drove the bike - a Yamaha 880 and a Norton 850 whilst Chris balanced on the side-car. Until last year, they competed locally and regionally, winning many cups and 4th place in the national league Twin-Shock Side Car Championship in 1998. His membership also brought us the services of June who has helped dispense the ‘cup that cheers’ after public meetings and the anonymous but vital job of distributing posters to the town. Before motherhood, June was a legal secretary and has acted as both Secretary and Treasurer of the Mother’s Union. It is a frequently uttered platitude that such an officer will be irreplaceable. Bill’s death was a shock personally and for the Society - since, after putting his functions on paper, it was clear that he did so much for the Society: perhaps too much. His passing will cause much sole searching as we come to terms with life without his unique service.